John Surman was born in Tavistock, Devon, in 1944. He first caught the attention of the British jazz scene by playing the often ponderous (in the hands of lesser players) baritone sax on Mike Westbrook's debut album, the very fine Celebration in 1967. Surman also played the more nimble soprano sax, and the bass clarinet (then not as well-known as a jazz instrument as it is today), and composed some of the music. 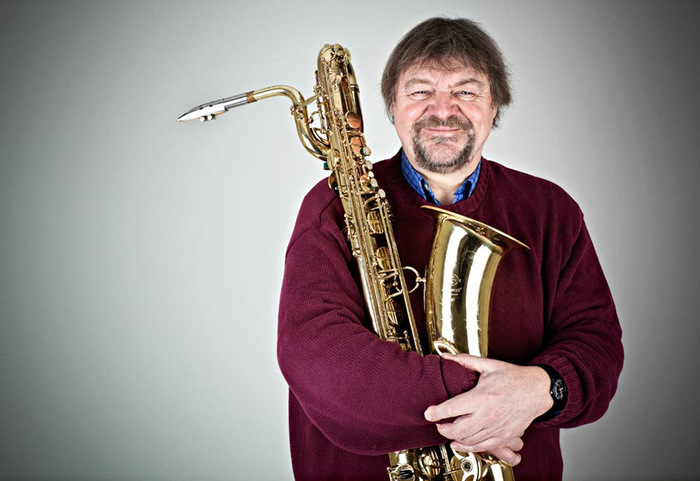 His own debut album as a leader, John Surman (it must have taken some ingenuity to come up with that title), from the following year, must be among the most surprisingly double-sided recordings. Side one comprises happy, sunny, foot-tapping calypso-jazz; surely no one could dislike this. But listeners who heard the first side and bought the LP on the strength of that alone were in for a shock, as when they turned it over they discovered that the second side has elements of discordant, confrontational avant-garde free jazz. I like it very much: familiarity with side two reveals that it's nothing like as anarchic as it at first appears to be, and it's often beautiful, but it's sometimes challenging, uneasy listening. I took a break from being on the road. This was just around the time when mono had become stereo,** and then - in a flash - multi-track recording became possible. I was fascinated by the possibilities of, say, three bass clarinets on different racks improvising together. Plus I had a curiosity about 'radiophonics' and tape manipulation and Pierre Henry's musique concrete. So it was in that spirit that I started work on what was to become Westering Home. The first piece, 'Mock Orange', begins with what are perhaps finger bells (and sound rather like Buddhist prayer bells, or a bicycle bell warning a pedestrian that they're about to be run over), a delightful opening to the seven album sequence. A duo of soprano saxes query and quest over a piano (the only time a chordal instrument features), sounding plaintive and folk-like. 'Watershed' is similar in mood, its descant recorder sad and longing, like a call from a far and distant time. (You can listen to it on Youtube*** here.) 'Rill-a-Ree' begins with solo baritone, very sombre and beautiful; at times the theme statement is like a penitential hymn tune played at quarter speed, but eventually an almost jaunty riff appears, while the baritone continues to ponder and probe, making use of multiphonics**** and getting faster and higher, ending the tune and the album on a literal and metaphorical high note. Some pieces seem designed mostly to explore the sonic possibilities of the instruments. 'The Druid' begins by exploiting the lovely woody sounds of the bass clarinet, and especially its bottom notes, while 'The Walrus' produces gorgeously weird sonorities by overlaying three bass clarinets, (and there is something endearingly walrus-like about these sounds), and by sometimes making use of their upper registers. Perhaps my favourite piece is 'Hornpipe', which begins with a melodeon playing what sounds very much like a traditional hornpipe dance tune (but perhaps is a Surman pastiche), with the odd discord thrown in to prepare us for what's to come. A baritone soon breaks in and the mood changes; there are Coltraneish sheets of sound, and after a while a soprano takes up the challenge and a frantic but exhilarating duel begins, each instrument trying to outdo the other in finding different timbres. The melodeon briefly tries to reassert itself, but fails. Westering Home is a highly accomplished first exercise in this new medium of solo multi-tracking. At times listeners might feel that it's getting a bit noodly and lacking focus (as at the end of 'The Druid', perhaps), and fans of the later, more obviously melodic Surman might find some of the free jazz-influenced moments tough going, but I'd ask them to persevere. 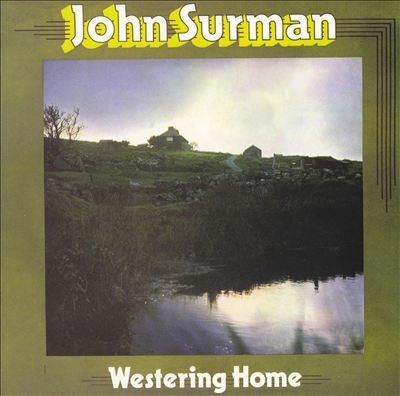 The later albums can be treated as background music if you want to (though they certainly deserve and reward closer listening too), but Westering Home is far more assertive and acerbic. Some of the album is rather mournful in mood (every composition appears to be in a minor key), but the overall effect is uplifting. 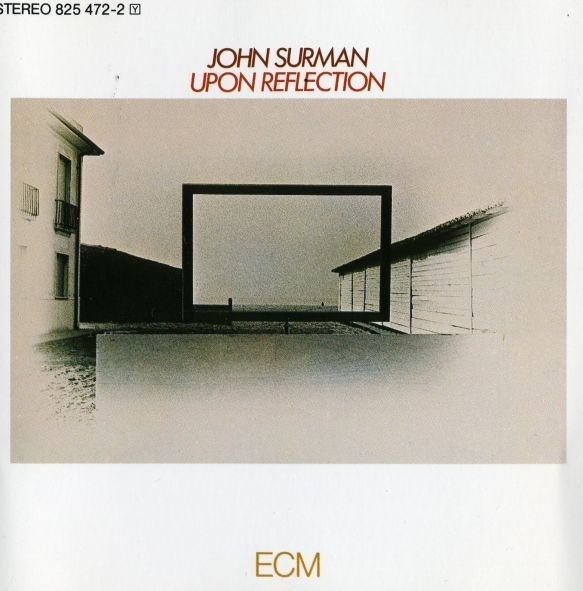 Upon Reflection (1979) was Surman's first recording on the ECM label, beginning a long association that has lasted until the present. (You can hear the whole album on Youtube, with some annoying adverts, here.) The first piece, 'Edges of Illusion', begins with over a minute of synthesiser ostinato before the lead instrument (bass clarinet) enters. This is music that takes its time and refuses to be hurried - there are no harmonic changes in more than ten minutes - in the manner of some minimalist or ambient compositions; most of the other tracks are much busier, however. Some listeners find the synth sounds (especially of the relatively crude 70's models) used on many of Surman's solo recordings unattractively tinkly. This is obviously a matter of personal taste; in some moods I too find them blandly new-agey, but much more often I rather like them. Anyway, Surman uses synths with tact and discretion; they feature prominently on only two pieces on this album. The second is the album's last composition, 'Constellation', in which they ripple rapidly like reflections in moving water (which is perhaps the source of the album's title). an infectious rhythm, sounding as if several instruments are (as the title suggests) following each other. It's a shame that it's less than 90 seconds long. 'Beyond a Shadow' creates a suitably umbrageous, even sinister mood, while a baritone indulges in Westering Home late-Coltrane pyrotechnics, and what sounds like a glockenspiel (but is probably a synth) glitters in the dark. 'Constellation', on the other hand, is another piece that feels like a dance and gradually builds up to an almost ecstatic conclusion. Upon Reflection is altogether more approachable than the previous album; it has some attractive melodies and is varied in mood, and the pieces are more obviously composed (though incorporating plenty of improvisation) rather than experimental. Except that one or two of the pieces are little long (and one is too short), it's very hard to find serious fault with it. My original intention was to write about all seven solo albums in one post; having written 1800 words on just two I realise this was too ambitious. There's more to follow, when I get around to it, on Withholding Pattern, Private City, Road to St Ives, A Biography of the Rev. Absalom Dawe, and Saltash Bells. * Bill Evans triple-tracked his piano on Conversations with Myself as early as 1963. Is this the first example of this technique? Is Paul McCartney's McCartney album from 1970 the first ever multi-tracked solo album by a multi-instrumentalist? (Though his wife Linda provides some backing vocals, so it's not quite 100% solo.) If anyone can enlighten me I'd be grateful; Doctor Google seems to be mute on these questions. ** The first mass-produced stereo record was released in 1957, and by 1968 all major record labels had stopped recording albums in mono, so by 1972 stereo was very well established. *** I've expressed doubts about the ethics of Youtube before, but I won't labour the point. **** Multiphonics is the simultaneous production of more than one note on an instrument (such as a saxophone) that normally produces only one note at a time.